It was Pandit Jawaharlal Nehru's dream that all the children of the nation must be educated. In memory of this great leader and to honour his love for children, November 14 is celebrated in India as Children’s day. It is said that God is closest to children because their hearts and minds are so pure. Pandit Jawaharlal Nehru believed that children must be provided with love and care as the future of a nation lies in their hands. Children truly deserve a day that is dedicated to them. So, W.I.S Bhilwara arranged a movie show-M.S.Dhoni for Grade I to VIII at Bioscope theatre on Saturday, November 12, 2016. Students enjoyed the movie show M.S. Dhoni - biopic of his life’s journey. It was not only a movie show but also a motivation and inspiration to learn that struggling at the earlier phase in the childhood and failing badly at the start of one’s life cannot stop to achieve the goal. Students learned that it is right for us to aspire, and that anyone can do it. This show was a treat for the students to celebrate and enjoy their day in a special manner because childhood is special and should be celebrated not as an ordinary day. Children's Day is to remind all young and adults about children's right to enjoy their childhood without any boundaries. We can imbibe some precious values in them through such celebrations. 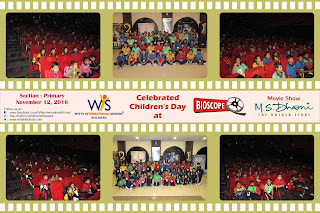 Thanks to all the members of Bioscope for their cooperation.